Eternal Orthodox Church calendar for the 19.03 year 2017. 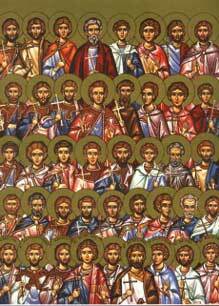 These were all generals under the Byzantine Emperor Theophilus. When the Emperor lost the struggle against the Saracens around the town of Ammoria, the Saracens took the town and enslaved many Christians, with these generals among them. The remaining Christians they eithe killed or sold into slavery, but threw these generals into prison, where they remained for seven years. Moslem leaders came many times, urging them to accept the Mohammedan faith, but the generals refused to do so. When the Saracens told the generals that Mahomet was a true prophet and Christ was not, the generals asked them: "If two men were to quarrel about a field, with one saying: "It"s mine! ", and the other saying: "No; it"s mine! ", and one had many witnesses that it was his field and the other had not a single witness but himself, what would you say - whose field was it?" The Saracens replied: "His, of course, who had the many witnesses. "You have judged right", the generals answered them. "So it is with Christ and Mahomet. Christ has many witnesses: the ancient prophets, whom you also recognise, from Moses to John the Baptist, witnessed to Him, But Mahomet only witnesses to himself that he is a prophet, and has no other witness." The Saracens were confounded, but attempted then to defend their faith thus: "That our faith is better than Christianity is seen in this: that God has given us victory over you, that He gives us the best lands on earth and an empire much greater than the Christian." To this the generals replied: "If that were so, then the idol-worship of Egypt and Babylon, and of Greece and Rome, and the fire-worship of Persia, would have been true faiths, for at some time each of these peoples has conquered others and governed them. It is obvious that your victory and power and wealth do not prove the truth of your faith. We know that God sometimes gives victory to Christians, and sometimes leaves them in torture and suffering to correct them and bring them to repentance and cleansing from sin." After seven years they were beheaded, in 845. Their bodies were cast into the Euphrates, but they floated to the other bank where Christians collected them and gave them burial. He was born in Moscow in 1635, and was drawn to the Church by the beauty of the singing and of the services. 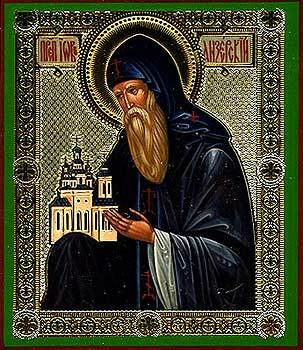 He became the confessor of Tsar Peter the Great, but, because of some slander, withdrew to the monastery of Solovetsk, where he lived in strict asceticism. He entered into rest in the Lord in 1720, at the age of 85. As his death drew near, he cried out: "Blessed is the God of our fathers! - and as He is thus, I have no fear, but go from the world with joy!" The father was already an old man, and the son a youth of seventeen, when they were sawn in half for their faith in Christ, and were glorified in the Church on earth and in heaven. They suffered with honour in 275. The Monk Arkadios from the time of his youth devoted himself to monastic efforts. The saint asceticised on the Island of Cyprus during the time of the emperor Constantine the Great (206-337). 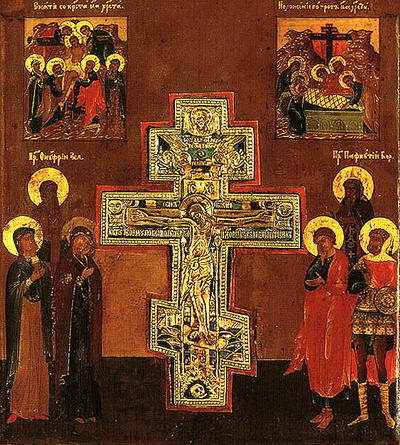 He was teacher of the holy Martyrs Julian the Physician and Eubolos, executed under Julian the Apostate (361-363). Bewailing the martyr's death of his students and having consigned their bodies to earth, the Monk Arkadios himself soon peacefully expired to the Lord. 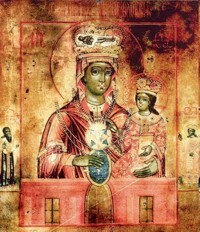 The wonderworking Czestochowa Icon of the Most Holy Theotokos is to be found in a Roman Catholic monastery at Yasna Gora near the city of Czestochowa, Petrov Province. It is believed to be one of the seventy icons painted by the holy Apostle and Evangelist Luke (October 18). Tradition says that the icon was taken from Jerusalem when the Romans conquered the city in the year 66, and was hidden in a cave near Pella. 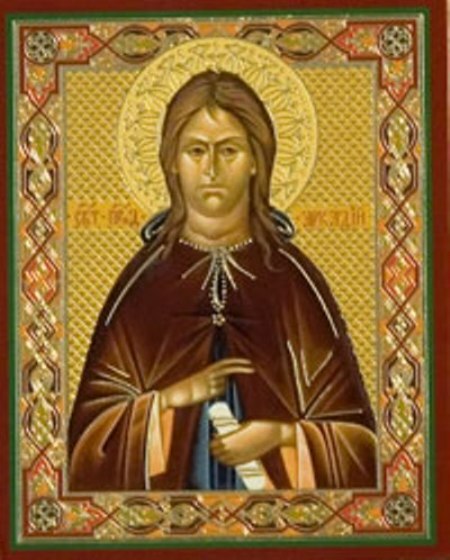 The icon was given to St Helen (May 21) when she visited the Holy Land in 326, and she brought it back to Constantinople with her.